This bed topped with quality leather look, give your bedroom an esthetic touch. 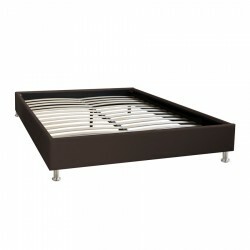 Sophia bed frame with box-spring bridges built in high quality faux leather (chocolate or white). Good quality/price. The set of Eva bed with her design of a rare elegance is perfect in a room decorated with care. It is available in several finishes: white leather look snow, gray or black.